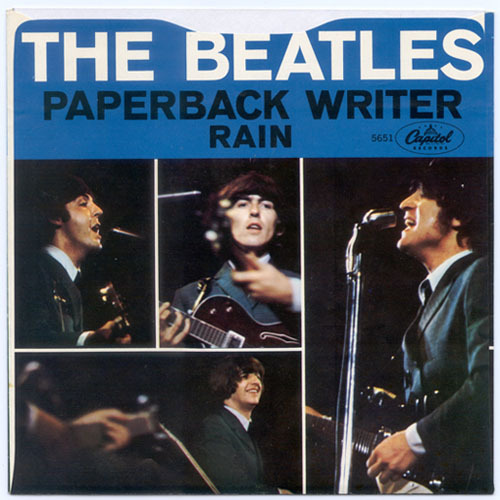 “Paperback Writer” is a 1966 song recorded and released by the Beatles. Written by Paul McCartney and John Lennon (credited to Lennon–McCartney), the song was released as the A-side of their eleventh single. Made in eleven hours, the track has a widely divided stereo image using, among other novelties, a drum part channelled separately across the spectrum (snare and cymbals left, tom-toms center, bass-drum right). For his prominent high-register bass part, McCartney swapped his Hofner for the long-scale Rickenbacker, a guitar with a solid, cutting treble tone which he modified by miking his amp through a second speaker and rolling off the top with compression to get a smoother sound.2 With a tape-echoed chorus, the vocal arrangement includes passages of four-part polyphony modelled on The Beach Boys, whose ‘Sloop John B’ had just entered the UK charts. That Lennon and Harrison were not entirely serious in performing their falsetto parts can be heard in the gasps of laughter audible on a very ‘dirty’ vocal track (and the fact that, during the second verse/ chorus, they are chanting ‘Frere Jacques’). When McCartney plays “Paperback Writer” in concert, he plays the opening riff on guitar and tells audiences that he’s using the guitar on which he originally played the riff in the studio. Which would make him lead guitarist, at least for that section of the recording.